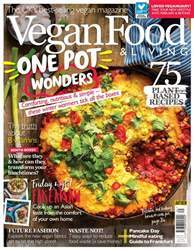 Digital Subscriptions > Vegan Food & Living Magazine > Feb 2019 > What happens in February? It was easier than I expected! I’ve heard this a lot over the years. In fact, it was one of the many revelations I experienced when I first went vegan. After the initial confusion, I was surprised at how quickly I settled into a ‘new normal’ and how much I enjoyed researching, cooking and, more importantly, eating vegan food. If this is you, then I imagine you’re wondering what you now tell the people around you. It probably feels a little too early to come out completely, but is also much more than a monthlong challenge that you can just move on from. If that’s the case, then I recommend saying something along the lines of what I said to my husband: “I think I might keep this up for a while and see where it takes me”. If your month was anything like mine then it’s unlikely it will illicit much surprise from your loved ones. In the mood for a warming one pot? We've got plenty of delicious vegan options waiting for you in the February issue of Vegan Food & Living. Also this issue, we reveal how to take your new lifestyle into February and beyond for anyone who has been doing Veganuary, plus we show you how Bento boxes can transform your lunches. If that's not enough, you can discover how to reduce your food waste, uncover the truth behind the B vitamins and whip up a Friday night fakeaway. Plus check out the hot new vegan fabrics set to hit the high street and explore the common misconceptions of being vegan.